Five-year-old Augie Augspurger clutched a copy of his favorite Little Golden Book, “The Saggy Baggy Elephant,” while the adults around him celebrated the iconic book series’ 75th anniversary recently at the Peoria Public Library. “I like elephants,” Augie said simply, unaware of the revolutionary idea that launched Little Golden Books and their legacy in American literacy. Little Golden Books were first published in 1942 at the height of America’s involvement in World War II and a time when most children’s books cost about $2 in high-end bookstores and were meant to be handled with care. “They made the books affordable and they made them available as never before, and that added up to a revolution in the accessibility of books for young kids,” said Leonard S. Marcus, a historian of children’s literature who presented a program with Muldrow at the library’s celebration. 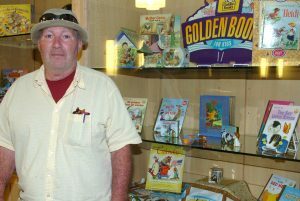 The eighth Little Golden Book, “The Poky Little Puppy,” is the only one of the original 12 still in print and is the best-selling picture book of all time, Muldrow said. 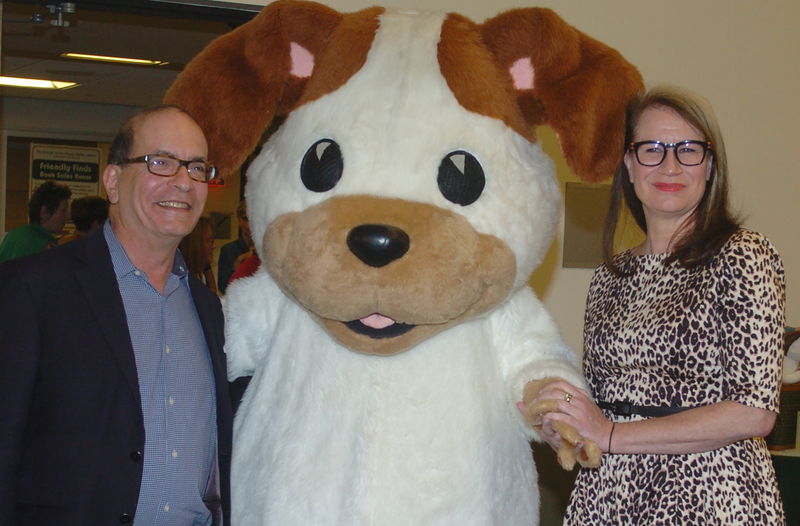 The poky puppy has gone on to become an American icon and even made an appearance at the library’s celebration. Rick Everetts of Washington, a local collector of Little Golden Books, donned the puppy costume for an earlier picnic at the library for children and parents and suited up again for the presentation by Muldrow and Marcus. 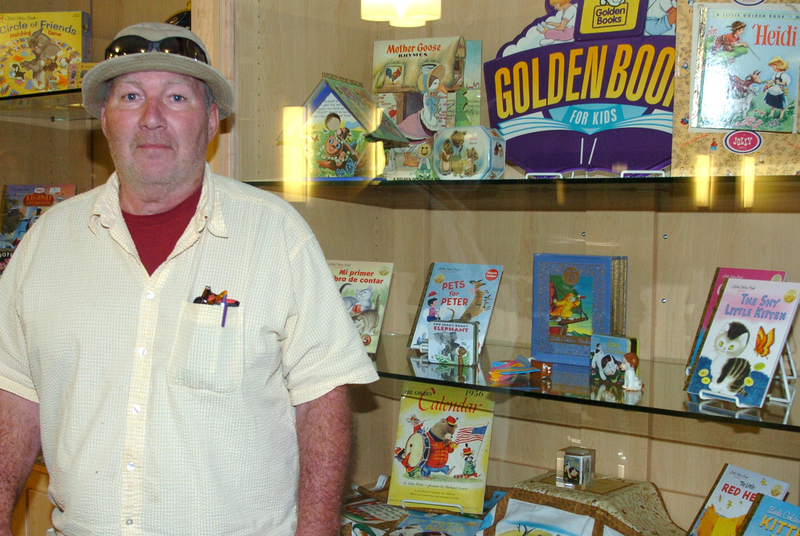 Part of Everetts’ extensive Little Golden Books collection was on display at the library during and before the 75th anniversary celebration. Pam said she and her husband both remember reading Little Golden Books when they were children. “They’re just wholesome, good old-fashioned books. They have good lessons for life,” she said. Little Golden Books are easily recognized by their gold foil spines, but the original books had fancy jackets with charming copy about war bonds, Muldrow said.The original publishers, the Artist’s and Writer’s Guild in partnership with Simon & Schuster and Western Printing, took a big risk in printing the Little Golden Books because an enormous number of copies needed to be printed to keep the price at a quarter each. “So 50,000 copies had to be printed of each of the 12 original titles. That’s huge risky numbers even by today’s standards,” Muldrow said. Within a few months time, however, the problem became keeping the books in stock as they flew off the shelves. Little Golden Books, with titles such as “A Year in the City,” “We Help Mommy” and “Five Pennies to Spend,” are deceptively simple stories about everyday life and how the world works. “It’s teaching without hitting you over the head, and that’s the charm, I think,” Muldrow said. Adults who reminisce about reading the books often remember the illustrations first. Muldrow and Marcus said the publisher hired illustrators who had worked for Disney studios and artists who fled Europe at the end of World War II to collaborate with talented writers such as Margaret Wise Brown and Richard Scarry. “The illustrators were some of the best of the 20th century. They were fine artists,” Muldrow said. By the early ’50s, Little Golden Books were being sold all over the world in at least a dozen languages. The only place they couldn’t be found was Russia. “Poky and his friends were considered a capitalistic symbol and were not allowed behind the iron curtain, which just shows me the power of the book. I mean, it’s a puppy right? But the puppy was not welcome there,” Muldrow said. “I do a lot of new titles every year that I hope will become tomorrow’s classics,” Muldrow said. The books sell for $4.99 each today. 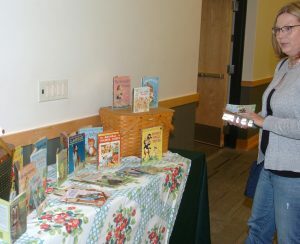 One of the 50 or so people who attended the anniversary celebration at the library was there for his sister, an avid Little Golden Books collector who lives in Texas. “My sister, Becky, told me about this and kept reminding me of it to make sure I would be here,” said Joe McMillan of Chillicothe. In addition to gathering information and purchasing any new books, McMillan was instructed to get a picture with the “Poky Little Puppy” mascot. 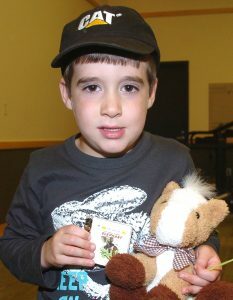 McMillan said his sister will be thrilled that he was one of three who won a set of 12 Little Golden Books in a drawing of those who brought their own Little Golden Books to the program. Jan Orr, who traveled to the presentation from St. Joseph, Ill., said she was surprised at how many of the books she remembered while perusing the display. “They were just fun to read. My dad had two big boxes of them that they had kept from our childhood, so we went through and divvied up our favorites,” she said.